“These fragments of the Story of Merlin are a wonderfully exciting find, which may have implications for the study not just of this text but also of other related and later texts that have shaped our modern understanding of the Arthurian legend,” Tether said in a statement. As the story goes, Arthur, Merlin, Gawain, and other knights are set preparing for a battle against Lancelot’s father's sworn enemy, King Claudas. The tale then goes on to describe Merlin’s strategizing of the attack, followed by a long description of the battle where, at one point, Merlin motivates the troops, then leads the charge with Sir Kay’s special dragon standard – one that breaths real fire. Arthur wins the battle in the end, just before the good drama really begins (complete with a new baby on the way, more battles, lucid dreams, and seduction). Researchers note the newly revealed fragments depict longer, more detailed accounts of the story, some only small details and others much more glaring. “There are many more differences, too, but because of the damage to the fragments, it will take time to decipher their contents properly, perhaps even requiring the use of infra-red technology,” said Tether. 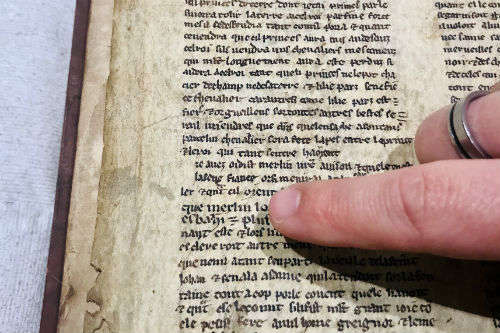 All fragments were found in books printed in Strasbourg between 1494 and 1502 before being sent to England unbound. The style of binding indicates they were likely first bound in the 16th century, say researchers. The parchments themselves were likely used as extra material to help with the binding process as parchment was often re-used because it was such an expensive item.